Get to enlist in multiplayer battles with teams of players to put your tactics into play. When your favorite voxel-based builder game gets married to a shooter type of game, you get a full force of unrelenting excitement to enjoy all throughout the day. If you think you already had fun with bricks, wait it out until you get to play this massive multiplayer online shooter game – Blocky Cars. Get to put your personal touch to your very own tank unit, pitch those great selections of weapons and equipment, and go all out crazy desolating everything on your way! Using a classic control style you are able to run around a vast array of maps and game styles, from solo and team deathmatches to fighting off waves of enemy tank units. In each and every game you play in, you get to customize your gears of destruction. As you play and kill other players, you get to collect points/resources, these points can then be spent on several upgrade items in the store. These items have a variety of uses, from extra ammo, new sets of tracks, new artillery, to boosts in armor. One of the really nice feature of Blocky Cars is that you can build and create your own fighting unit. Not only in the sense that you can equip stuff that is sold over its given game shop, but you can design everything, from how it looks, where you situate its wheels, turrets, and seemingly every single thing to affect its physics and performance in the battlefield. Once you have created you battle unit, you’re all set to get things blown to smithereens. The gameplay itself is pretty straightforward, you are given the usual WASD controls for navigation, and mouse button for shooting and scrolling through the different things to put up and build in the game. There are a few other keys too that are pretty useful and are easily learned over the tips during loading phases of the game. The game though does not provide any means to configure these control buttons, but can be dealt with via macro-configurable buttons in specialized keyboards, mouse, and game controllers. The graphics quality you get (vehicle, weapons, and environment) is pretty decent for a free to play “voxel-based” game, most especially considering that you don’t need to install it in your system. The flow of the game is relatively smooth and the overall feel of it quite tolerable (hit, recoil, movement, and general physics). Overall there is a lot of great stuff packed into this exciting shooter/builder game. It’s like throwing some Lego tanks to put up, and then pitting you straight onto the death-match battles. A lot of fun sessions to play, the variety of purchases to gain, and the heart pumping action that gets delivered to its participating players. 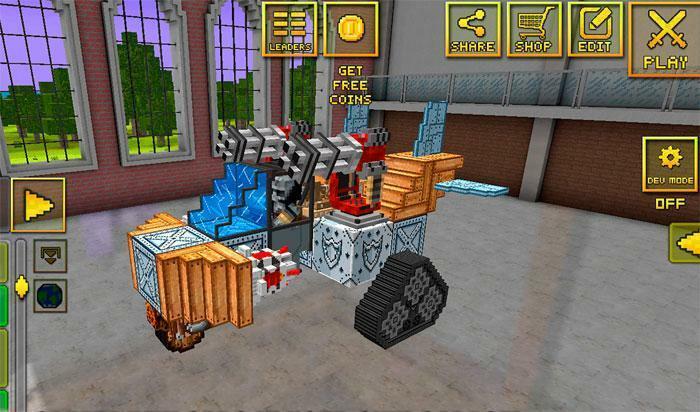 With a huge range of items and the ability to upgrade your stuff therein, Blocky Cars covers every aspect of both builder and shooter games, the way you want them, and in a really awesome kind of way!